Modular range of drop stackers which can be fitted to any HJ Weir combination folder. Available in multi station for autograding. Single lane automatic collector and counter of small pieces. 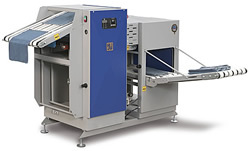 Multi-lane Crossfold stacker compliments the 35, 55 and 64 Folders. Freestanding version is also available. 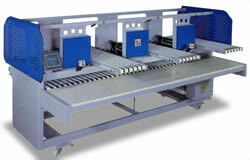 Multi-lane in line Stacker compliments the 35, 55 and 64 Folders. Freestanding version is also available. 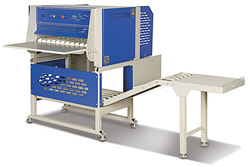 The “Automatic Collector Unit ” is built integral to the rear delivery table of a Foldmaker 35, 55, 64 or 64+12 and is designed to collect unfolded small pieces which are bypassed through the folder.